EMCORE Corporation has introduced its new EN-150 Inertial Measurement/Navigation Unit for unmanned aerial vehicles, dismounted soldiers and weaponry, platform stabilization and applications where GPS is unavailable. Designed with options for full navigation, or as a higher performance, smaller size replacement for Ring Laser (RLG) Inertial Measurement Units (IMUs), the EMCORE EN-150 is the smallest, most affordable Fiber Optic Gyro (FOG)-based IMU available today at its performance level. 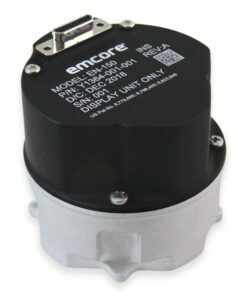 The EN-150 Inertial Measurement/Navigation Unit expands on EMCORE’s IMU product line that also includes the EN-300. Measuring a mere 2.6” in diameter by 2.24” tall with only 11 cubic inches total volume, the EN-150 is a three-axis, closed-loop FOG design that is one-third the volume and size of the competing units. It features the EMCORE’s proprietary, solid-state FOG transceiver with next-generation, integrated Field Programmable Gate Array (FPGA) electronics to deliver up to twice the performance of legacy IMUs with increased reliability and lower cost. The EN-150 can be ordered in performance versions with bias drift as low as 0.5 degree/hr and Angle Random Walk (ARW) of 0.02 degree/rt-hr. This makes it better suited for precise targeting, line-of-sight stabilization and GPS denied navigation than older generation RLG units with bias drift typically between 1 to 5 degree/hr. Bias drift is an important measure of accuracy and precision of the IMU, with lower bias models delivering higher performance overall. The internal signal processing of the EN-150 IMU provides two standard IMU outputs, raw acceleration and rate data at 600Hz, and navigation data at 100Hz that incorporates coning and sculling compensation. The unit also has options for full stand-alone or aided navigation utilizing external sensors such as GPS.